How do you like to vacation? A hike with a view to get your heart pumping in the morning. A long, al-fresco lunch under a giant, shady tree. An afternoon swim followed by a beach nap. More local dishes and wine under the stars. Then a sound sleep in a very comfortable bed. It sounds like heaven. It also sounds like Greece. Most people forget the Greek islands once fall rolls around. By the beginning of September, the beaches are empty, the ferries don’t run as often, and most Greeks have returned to the mainland. But the postseason is a great time to visit the Cyclades. The temperatures are still in the 80s. It’s grape and olive harvest season. Accommodations are cheaper. Plus, did anyone mention the beaches are empty? Especially on Andros. 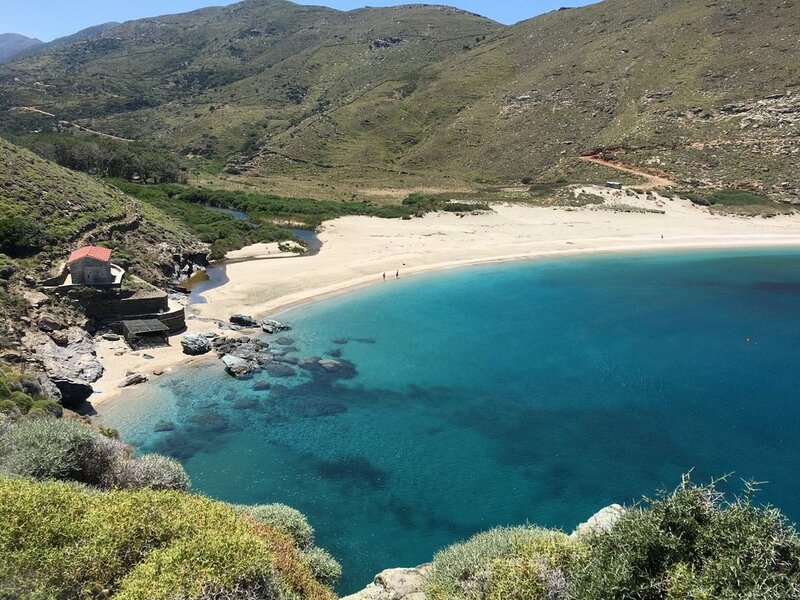 During the high season, the northernmost island in the Cyclades doesn’t receive anywhere near the number of tourists that Mykonos, its neighbor to the south, does in the offseason. The big island—it’s the second largest in the Cyclades—is known for its peaceful setting. High mountains are intersected by fruitful valleys. They’re fed by four rivers that run from west to east. Picturesque villages, ancient stone bridges, pristine beaches, and well-marked hiking trails surround them. No wonder everyone in the area—the Athenians, the Romans, the Genoese, the Venetians, the Turks, the Ottomans, and even the Russians—fought for control of Andros at one point. Somehow, despite being only two hours from Athens, tourists haven’t caught on yet. Especially on the northeast coast. This is where you find Ahla, a well-protected beach at the end of a bumpy, five-mile track (a road would be too generous of a term). The beach is secluded (obviously) and covered with shiny, white pebbles. Vourkoti, a mountain village, stands above it. Calm, crystal water with a blue-green tint stretches out in front of it. The narrow Ahla River drains into it. While a small chapel and lighthouse stand guard on the rocks at opposite ends. Freshwater crabs, rare migratory birds, and a flock of sheep from a nearby farm always outnumber people here. There’s one more thing near Ahla Beach: Onar Andros. 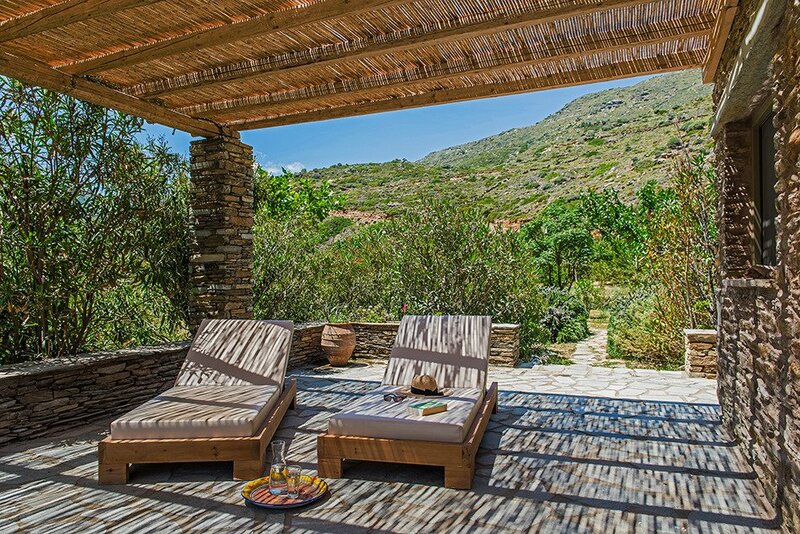 Onar means dream in Ancient Greek, and this rustic-chic hotel certainly looks like one. Its farmhouse-style cottages are made of stone, wood, and river reeds. You find exposed wooden beams and logs stacked next to a fireplace in your minimal cottage. Sliding-glass doors lead to a veranda sheltered by a bamboo pergola. Two sun loungers, a hammock, and humming cicadas are hidden below it. An overgrown stone path leads to a long, communal table near the kitchen. It’s littered with yogurt and feta, artichokes and eggplant, shellfish and lamb chops, wine and ouzo throughout the day. Most of the food is drenched in golden-green olive oil. So, hiking, check. An outdoor lunch, check. A gorgeous beach, check. Dinner under the stars, check. Plus an adorable little cottage, check. Suddenly, it’s starting to make sense. No one wants to share this little gem once they discover it. It, too, might be a fall secret that you want to keep for yourself.